When you need a professional team of expert crane operators with access to a range of modern cranes and transport equipment, you need MIA Crane Service. 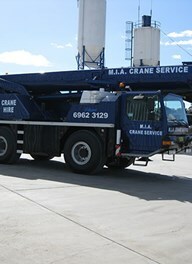 MIA Crane Service has the advantage of two depots – based in Griffith and Leeton; this gives you, our customer, the geographical advantage of having our cranes closer and more convenient to your job. We provide an efficient and affordable crane hire service to the entire region and we’re completely adaptable to your logistical needs. 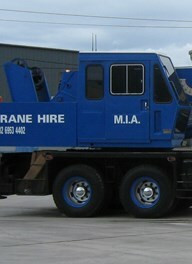 With an expanding fleet of cranes, including Franna and Slew Cranes, MIA Crane Service offers a range of modern mobile cranes ranging from 15 tonne to 55 tonne as well as a 3 tonne Telehandler for those smaller jobs. 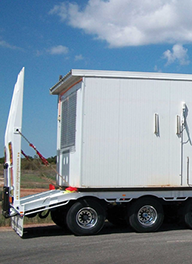 MIA Crane Service can also provide transportation services with our drop-deck trailer, making us the most adaptable mobile crane service in Leeton and Griffith. Offering a team of seasoned riggers with the required licences and training to carry out your job efficiently and safely. No matter the job you require our dogman or rigger for, you won’t be disappointed by their expertise and professionalism. No matter where you are in the region, from Griffith to Leeton, MIA Crane Service has the rigger and dogman teams for you. If you have any questions about our personnel, equipment or simply want to book your hire, contact us today. We’re happy to answer any of your questions. 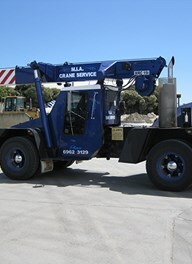 The 55 Tonne slew crane is the largest of our fleet. Like the 25 Tonner, our Tadano GT-550E is a road driven slewing crane incorporating a rotating boom or jib, but has a larger lifting capacity. Our tri-axle drop deck trailer is 13700mm long (45’) TBC including 1000mm beaver tail and 3000mm x 1000mm wide rear ramps with grip bars and air holes. The top section is 3950mm and bottom is 9750mm. Our float is ideal for the transportation of machinery, containers and general freight. 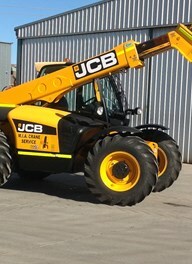 Our JCB 531-70 Telehandler is now available for hire in Griffith and surrounding areas. It has Maximum Lift Capacity of 3 Tonne and Maximum Lift Height 7m with easy operation, a tight turn radius and great manoeuvrability. Contact our office for more information.